George is starting his own business and is looking into ordering business cards with his new logo and information. We love the look of Moo cards that have a stripe of color in the middle of the card. It’s a really nice way to add a pop to your business card. The only problem is they can cost over 50 cents a card! 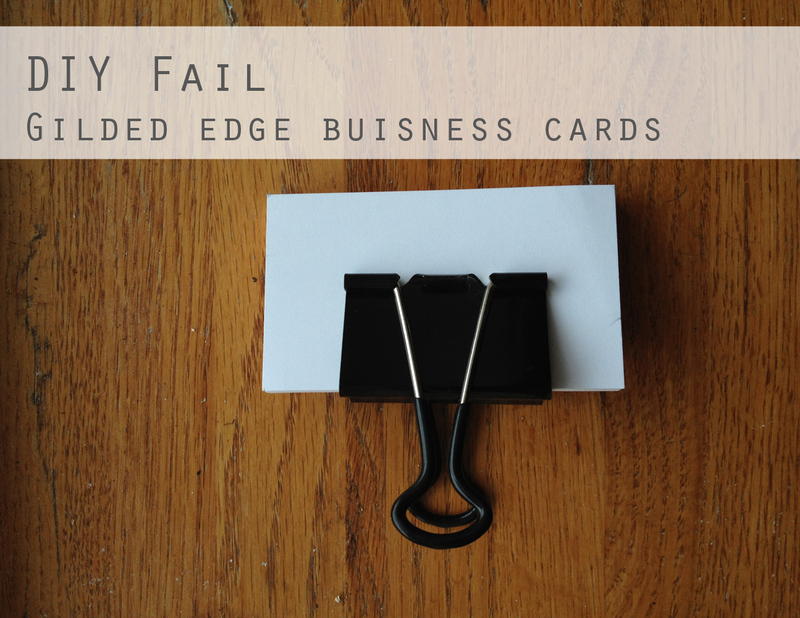 On Pinterest I saw someone who had spray painted the edges of their business cards in order to get the gilded edge look. I thought this would be an excellent way to add a bit of color and interest to his cards without shelling out major cash for fancy cards. We gave it a shot on George’s old business cards, and it did not work out! We used a large binder clip to hold a stack in place. For the two outside cards, we placed someone else’s card face-in to not waste his cards. George just held the cards with a plastic bag and did a light coat on the cards. It dried almost immediately. 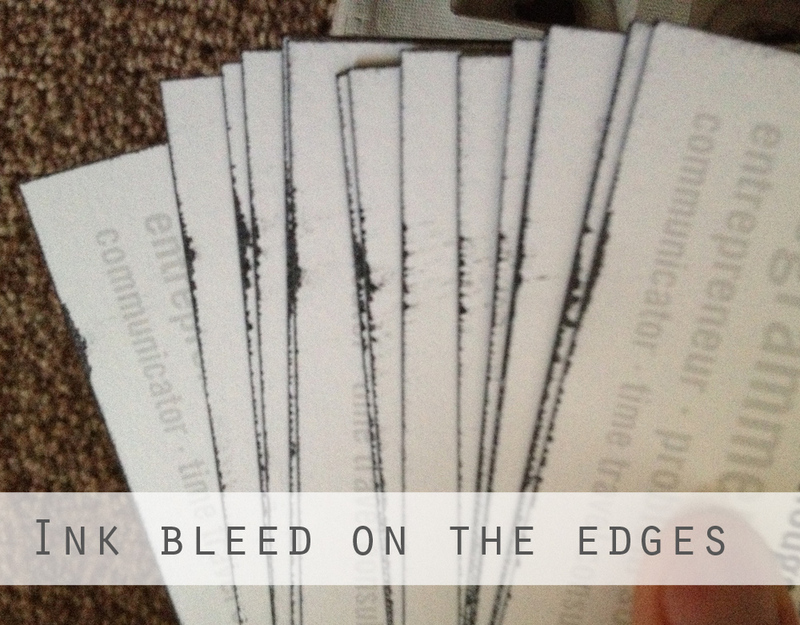 The fail was that the dye from the spray paint crept up on the cards, making a really messy looking edge. I don’t know if this is related to the type of paper, but it was a definite failure. 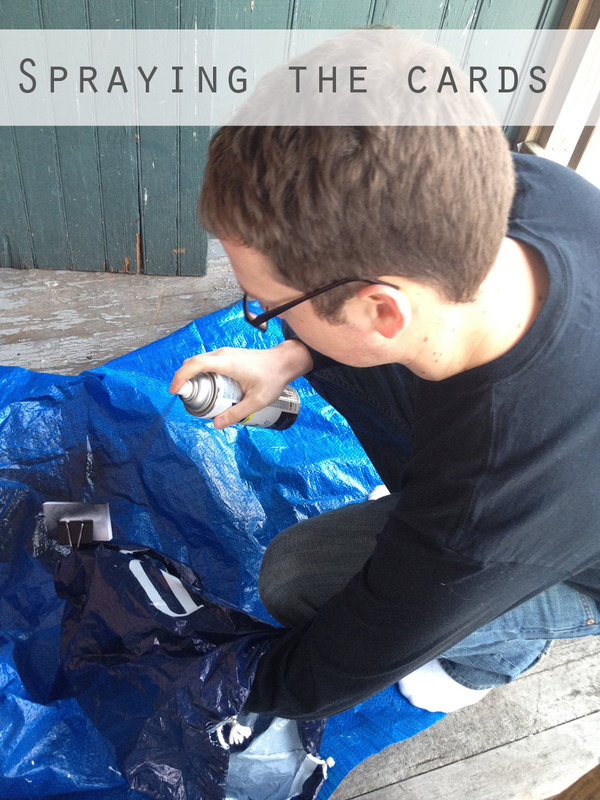 I would not suggest trying this spray-painting tactic. I’m still curious how it worked out so well for other people, but it certainly didn’t work for us. That’s interesting! We love the side of Moo’s cards too but ended up going with our graphic designers business cards instead. I would have never thought about painting the sides! P.S. I’ve had a few DIY fails as well lately! It’s nice to hear someone elses!! I’m always nervous to show projects that don’t work, so I’m glad you appreciate it. Thanks for stopping by! I admit, it’s nice to know I’m not the only one out there who has a few Pinterest fails under her belt! 🙂 Dunno if you’ve already tried this, but you could try just painting the edges with a brush, instead of spray painting them. Have done this in the past using one of those foam brushes and thinned down metallic paint onto the edges of invitations made of card stock. It’s worth a shot! We also tried using sharpie but it still made an ugly bleed. Who knows…It might have just been the paper. The Moo Cards are certainly gorgeous, but $0.50 a card hurts. I think you’re right about the paper. I didn’t try that one. Thanks for the suggestion! I might try on some of my business cards and see if other paper works better.